Last weekend we got to take The Kid out again, but he’s still in search of his first chukar. He got a couple shots off over a nice point by Peat, but no cigar. Still, it was a gorgeous day out of the fog shrouding our wee valley to the east of Hells Canyon. Also, I have a new Q5 Centerfire Upland Vest (Quilomene), which can be seen in the latter part of the video. I’ll give it a thorough review next fall after I’ve had a chance to put it through its paces. The first outing with it was good. Great video. I’m super interested in your review of the vest. I’ve been looking at the vest on line and it looks perfect with the detachable pack. I like the looks of your new backpack. It looks like most, if not all, of the weight is transferred to your hips. How much do you think it helps your ability to shoot? I’ll have to use it more to know. My other pack was actually much more streamlined. Bob, this weekend while Chukar hunting I got caught in a small avalanche. Rode 200 yards downhill to the bottom of the draw, totally out of control the whole way. Luckily my black Lab was determined to “save my life” if he needed to. Never happened before (to me). Thought you would be interested. Holy crap! 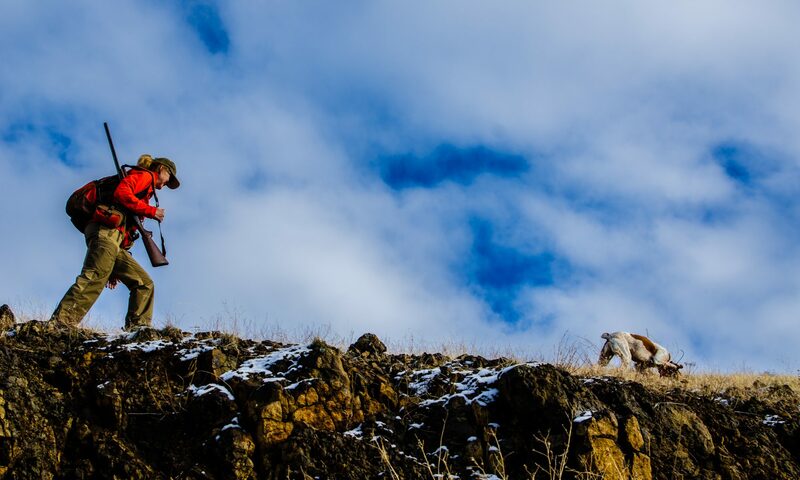 An avalanche is something that has never crossed my mind when it comes to chukar hunting. Glad you’re okay. Maybe you should teach your Lab to use a transponder! Wow. This is gonna stick in the back of my mind for the next few weeks. You still have that Cabelas Lite N Bird vest? Im interested to read the review on the Q5! Yes, my wife uses the Cabela’s vest. A friend of mine bought a new one last fall from Cabela’s. I think they still sell it? Good looking vest!!! One thing I’ve noticed with mine is that you want to take som Velcro wraps and tie up the excess webbing once you have it sized. Seems to slip a bit if you don’t. Hey Jason, I meant to email you that I got the vest. Thanks for the tip on the straps; I noticed a little slipping (on my other vest, too). I’m hoping to get it out this weekend for a longer jaunt. It’s a tall vest; I’m 6′ but I have the shoulder straps pulled as tightly as they’ll go and it just barely fits. For what’s it’s worth you look much taller in photos and video. Ha!!! I did notice that it looked a bit bigger on you than me. If you go to Home Depot or the craft store they usually sell these cord wraps which have both sides on the strip. They are meant to wrap back on themselves. If you cut a two or three inch strip and place it at the bottom of the webbing then roll the webbing up till its tight to the top you can then wrap the velcro on itself and it’ll be nice and tidy. Bob, I have always been a silent observer/follower of your blog. I must say that I quiet thoroughly enjoy reading about your adventures there in Western Idaho. I wanted to chime in and say congrats on the new vest. I personally wear a Wingworks vest, but that Quilomene looks right up the same alley, hopefully it ends up being a great vest for you. I am also glad to see that Peat is coming along for you. I am in a tough situation with a younger GSP right now, and like you I am not willing to throw in the towel just yet. I look forward to your future adventures! Keep up the good hunts!